Moira is the hostess with the mostess at the Slow Blog Linky party today, for people who occasionally find that life gets in the way of being creative. You don't have to drop out of the loop - there is plenty of time before the link closes, so join in and hang out with some fellow slow bloggers. After a slow start to the year work has been really busy this month - I'm a gardener, and have clients, an allotment and garden volunteering stuff I do at the children's school so things have been a bit mad. My own garden is tiny so I have to make the most of pots. The cat has decided that the pot on the left is actually a cushion installed specially for him. Also although in my head I'm still about 26 I seem to have turned into a mummy and am endlessly ferrying small kids from one class or social event to another - not sure how that happened. It wasn't all work though because I made the round trip of 280 miles and dropped off the children at their grandparents for the first time, and got to spend a weekend with my husband. There was a lot of culture (well, alright, it did include Iron Man 3), eating and drinking, and just sitting. 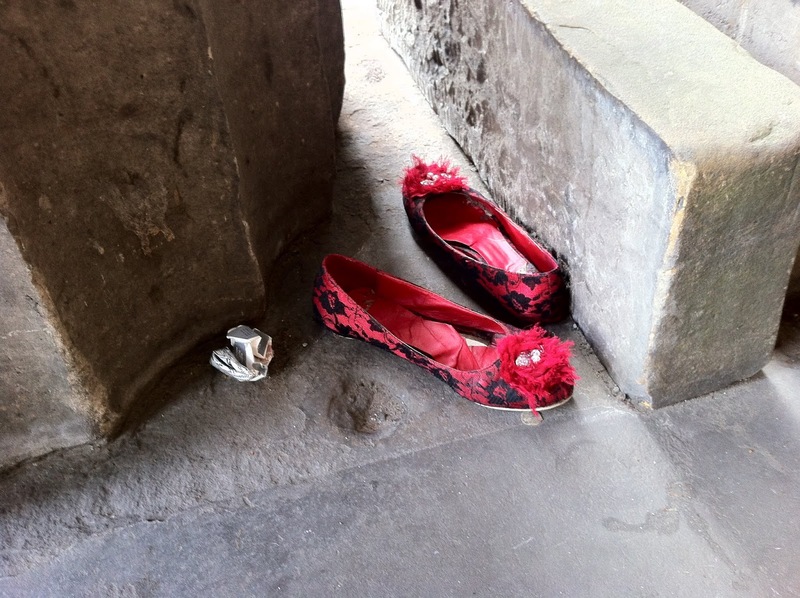 We found these shoes - wonder what the story is behind them. I hope that someone very young and happy walked home barefoot and carefree after dancing the night away. With the luxury of no interruptions we also managed to build and instal a coat rack down our stairway - we know how to live the high life! Do you think there's any chance of making another quilt in four days and entering it in the Blogger's Quilt Festival? What about you? I'm looking forward to hearing what other Slow Bloggers have been up to. Excellent choice on tulip colour there! I had the same in pots last year, this year the dark ones have come up but there's no sign of the pale ones - they did get a bit decimated by the snow :-( I left them in the pots over the year, should I have done something else with them? Sounds like the perfect weekend, kids taken care of, culture (I am not including Iron Man 3 in that!) eating and drinking, what more could you ask for? Lovely photos.Glad you enjoyed your weekend. A quilt in four days? Not sure I would manage it. Yea for gardening and fun away times with hubby - neither of which I seem to have done for a while!! Sounds like you had a wonderful weekend. Those tulips in your garden are beautiful. The purple is stunning. Lovely post! I think the red shoes owner just got pissed off with the lining being annoyingly scruncled! I guess spring is a busy time for gardeners, a lovely job-at least from afar! Why don't you sum up your latest quilt for the bloggers quilt festival, that would be a great entry. Sounds like a great w/e. totally get the 26 thing. Some of my kids even seem to be leaving home now. Happy and sad- I can't keep up.